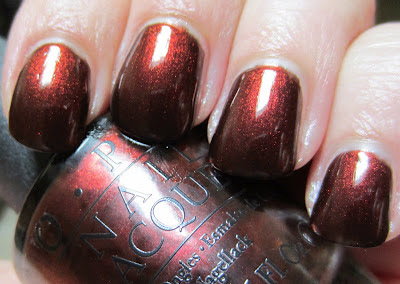 OPI German-icure is the only shade I picked up from their Germany Fall 2012 Collection, and I love it! Deep, dark, vampy, rich...a lot of appealing aspects to this one. 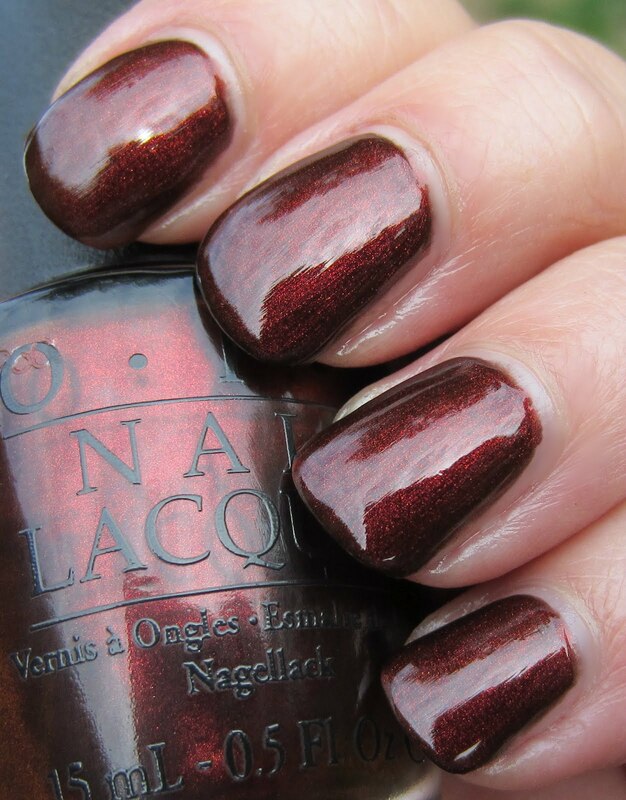 The dark charcoal base gives this shimmery burgundy wine shade an added dimension, creating almost a vignette effect. Two coats covered nicely, and I used a top coat in these photos. I love the way it has a plush/velvet look. 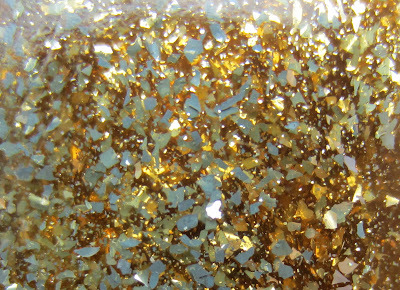 Pictured outdoors under cloudy skies above, and indoors in house lighting, you can see it has a touch of gold in the shimmer and a very slight brown tone in certain lighting. I've been thinking about OPI's upcoming gold leaf top coat called The Man With The Golden Gun, and I've also been thinking that $30.00 for that polish is a pretty hefty price tag! 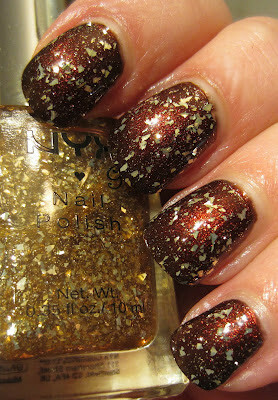 NYX Gilded Glitter might be a comparable alternative, sans the price tag and the pretty gold plated bottle. 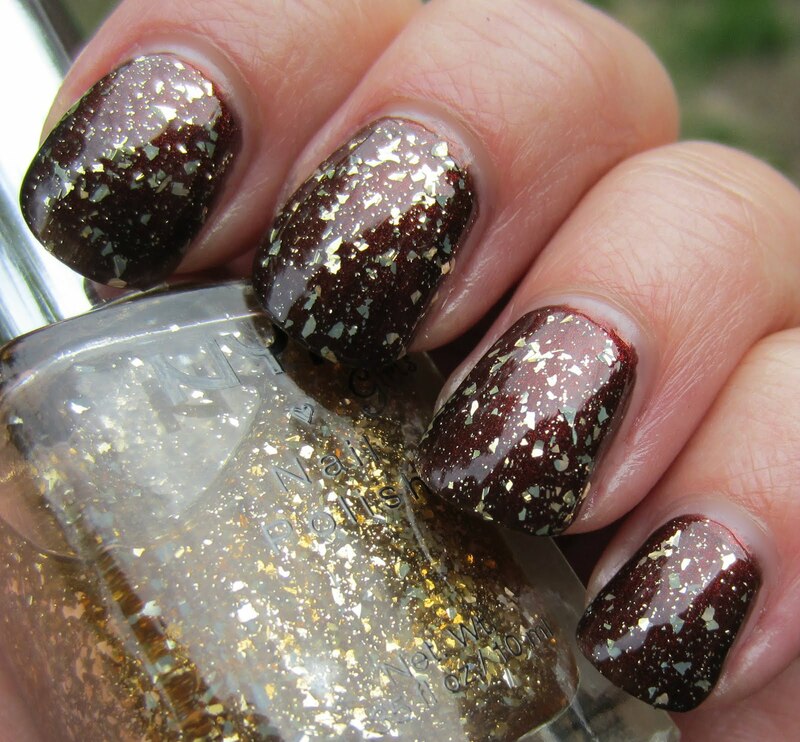 Below are a couple of photos in different lighting using NYX Gilded Glitter over German-icure, and I used two coats. 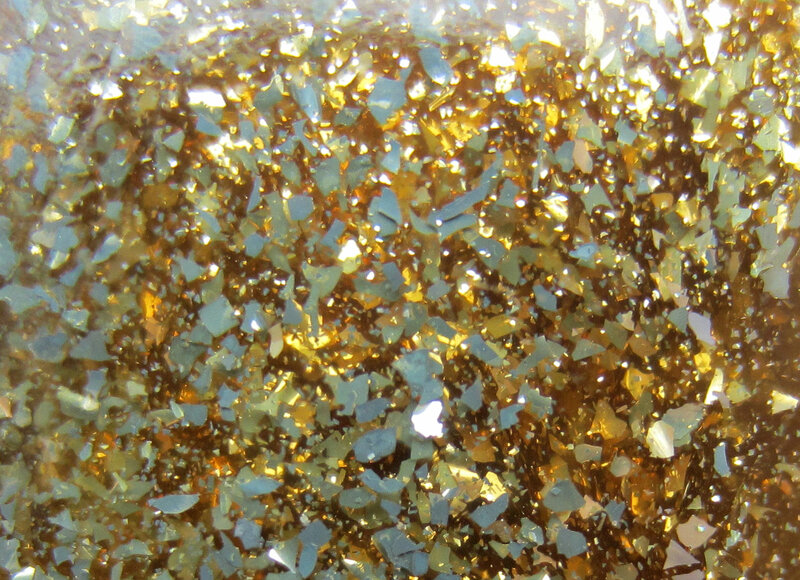 If you look at the macro shot of Gilded Glitter in the bottle, you can see that it's filled with various shapes of gold glitter, none of them uniform. It's also got tiny gold glitter mixed in with the larger flakes, and this shade has a very pale gold tinted clear base. 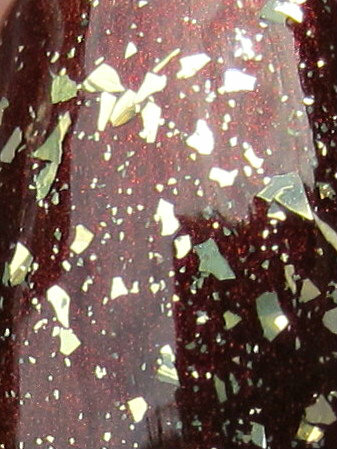 The nail macro shot shows a better depiction of the shapes, and what I like about this glitter top coat is that the glitter is so imperfectly shaped. It does give the illusion of shredded gold leaf, and for about $2.00 a bottle, I think I can pass on the OPI shade. 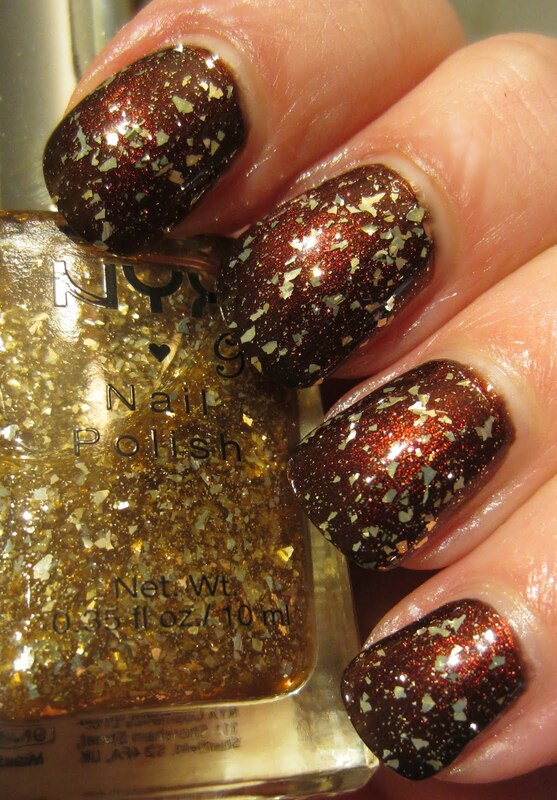 Are you tempted to pick up OPI's The Man With The Golden Gun when it comes out? I would say that I was initially, but I'm satisfied with other alternatives. At $2 a bottle, I would also just stick with this :D I am loving dark nails right now, and this color is just so awesome. Thanks for this! I was going to check out AA Meteor Shower as a comp but the flakes are a bit large and rugged... This is a closer comp, much appreciated!